While I draw hope that the fact two out of three of DC's weekly series involve the word 'End', The New 52: Futures End and the just announced Earth 2: World's End, my previous hope when it comes to DC was finally set in stone this week, with the news writer Grant Morrison's Multiversity will hit in August 2014. Featuring an array of artists including Frank Quitely, Cameron Stewart, Chris Sprouse, Karl Story, Ben Oliver, Ivan Reis, each issue will be 40 pages of Morrison-imagination, set in a different parallel universe to the last. "Comprising seven complete adventures — a two part framing story, and comprehensive guidebook to the many worlds of the Multiverse", it seems a decent companion piece to the fun of Grant's Seven Soldiers project is finally here. As Grant himself puts it on CBR “Prepare to meet the Vampire Justice League of Earth-43, the Justice Riders of Earth-18, Superdemon, Doc Fate, the super-sons of Superman and Batman, the rampaging Retaliators of Earth-8, the Atomic Knights of Justice, Dino-Cop, Sister Miracle, Lady Quark, the legion of Sivanas, the Nazi New Reichsmen of Earth-10 and the LATEST, greatest superhero of Earth-Prime — YOU!" Proving my fan mantra, that 10 pages of Grant having an 'off-day' is worth a bazillion pages of your run-of-the-mill comic writer at their best, there's not one concept in the list above that doesn't get me excited to see its execution. 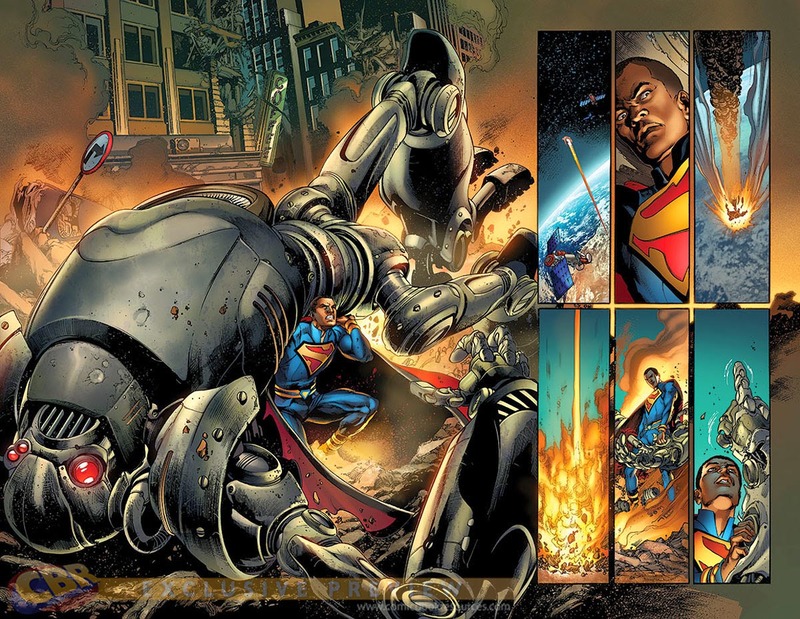 From Grant's love of Sivana as a character coming through, to Dino-Cop, the sons of Superman and Batman, and putting the reader on the front lines in the brawl for it all, it already seems fresh, even though the project has been navigating the changes and workloads of the DCnU for years. All pitted against the "Demonis Destroyers" the Gentry, the unsung character of the mini-series will be Ultra Comics. No sadly not the awesome Ultraverse formerly of Malibu Comics, now sitting in a dusty unused section of the Marvel patents office, but rather a tip of the hat to The Flash of Two Worlds by Gardner Fox, Julius Schwartz and Carmine Infantino, where Barry Allen choses his name from reading a comic of Jay Garrick's "fictional" adventures. Meaning each universe in Multiversity will (guessing from the 'versity' in the title) teach the next about the threat of the Gentry, through their lives printed in CMYK in the next. As I was when I first heard of the concept, I am still definitely sold. I am someone who had read a lot of Morrison's stuff. He is hot and cold with me. Often, lately, he seems to hate comic fans more than he loves to tell us good stories. The mess he made of Batman comes from him telling only half the story. I bet he kept all the real good parts in his head. Sounds like tons of stuff going on at DC, who over the past year have axed quite a few titles. I shall be viewing some of these curious titles with interest. Thankz for the comments guys. Kal, I'm not a main character reader, so I left Grant's Batman alone, except for Frank Quitely's issues of his Batman and Robin and the bat-pirate promising Return of Bruce Wayne. Like you say one of those ran hot, the other cold, but both were awesome concepts. What he keeps to himself I wonder is it bigger than what editors trim down? IMO Karl, huge axes need to swing at DC. If they keep the DCnU going, they have to do a better job promoting titles other than Batman, Superman and Justice League. Sure you've got to market books whose return covers the expense, but by the same token there's no point labeling a comic a low-seller, when you're not banging any tamborines to entice people in tbe first place.